sportsmatrix » ‘Tis the Season to be Jolly! As the festive season rolls on, people all over the world are rushing out to buy gifts for their nearest and dearest. In fact, this time of the year is more about the giving and receiving of gifts than anything else. With this feeling of generosity in the air, we have taken all the stats at our disposal and have put together a special gift for you! We looked at and analyzed every game played in the Premier League in order to see how many ‘gifts’ the various teams give to their respective opponents. For the sake of our research, we defined ‘a gift’ as a serious mistake by either the goalkeeper or one of his teammates that results in the opposition either being placed in a dangerous situation in front of a goal, a penalty being given or a goal being scored. We’ll start off with the team that encompasses all that Santa Claus stands for – that is Norwich City who are most generous, having given their opponents 16 gifts over the course of the season so far. 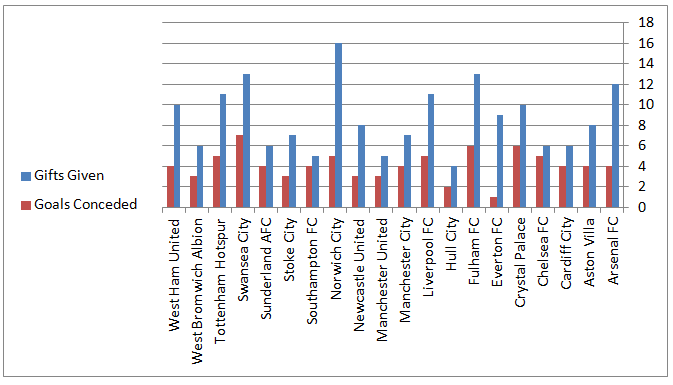 Fulham and Swansea follow close behind with 13 presents given each. The most surprisingly generous team is second place and early pace setters Arsenal who have given their opponents 12 lovely gifts! Seeing this must raise questions as to if Arsenal had not been so generous with the giving of these gifts, how far ahead of the chasing pack would they be. It remains to be seen how much this will come back and haunt them. On the opposite end of the spectrum, the team that gives the fewest gifts is another surprise. 12th placed Hull City have only given 4 presents all season! Southampton are close behind with only 5 given – this is expected given that they have one of strongest defences in the Premier League this season. For all their troubles this season, Manchester United have also only given 5 gifts this season. This is actually more worrying for the champions as it seems that teams don’t need to rely on their generosity to be able to score against United. When looking at the teams that receive the most gifts, it is no surprise that current league leaders also are at the head of this table. Liverpool have received an impressive 18 presents from their opponents, this being significantly more than the rest of the teams in the league. The nearest teams to Liverpool are Manchester City and Chelsea who have received 13 each. Poor West Ham are feeling the wrath of the Christmas Grinch having only received 3 gifts all season. they taken advantage of the overwhelming generosity of their opponents, they could be a lot closer to winning their first league championship in 24 years. Manchester United, on the other hand, have made full use of the gifts that they have been given and scored 7 goals from their 9 so far. Chelsea and Manchester City have both scored 8 goals from their 13 gifts. When it comes to goals conceded as a result of being so generous, despite giving 16 gifts to their opponents, Norwich have only conceded 5 goals. Swansea lead this unfortunate table having conceded 7 goals from the 13 presents that they have given thus far. Chelsea and Southampton share the dubious honour of the greatest return of gifts given. The Blues gave 6 which led to 5 goals being scored and Southampton gave 5 which resulted in 4 goals being scored. Everton, on the other hand, whilst giving 9 gifts, have managed to make amends by only conceding 1 goal. There is no doubt that these gifts have helped shape the Premier League table thus far and it will be interesting to see what kind of an impact this will have come the end of the season! One thing I would say is it is possible to analyze if the “gifts” given were also partially due to the pressure or ability of the other team? Or are they totally the fault of the gifter? For example, Liverpool, City and Chelsea receive the most “gifts”. Is it a coincidence that they are among the top teams? Excellent article. Keep ‘em coming! Hi James, thank you for your comments. It is certainly possible to analyze if the gifts were related to attacking pressure. For this post, however, we decided to only look at defensive errors that led to these situations. Great. Cheers for getting back to me. Looking forward to seeing something around the teams that best pressure defenses. I think that would make interesting reading. 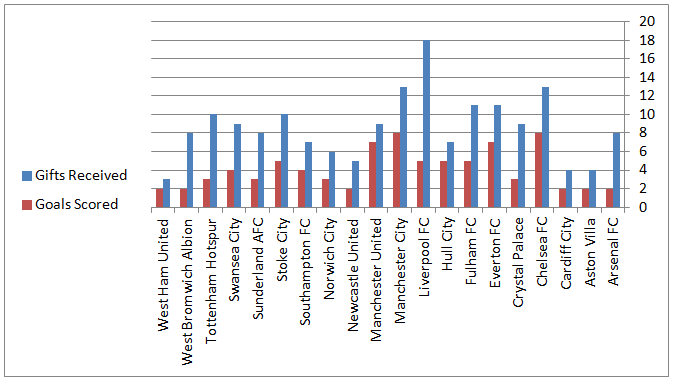 Pingback: Which Premier League Teams Score (And Concede) The Most Gift Goals? Pingback: How many gift goals does Manchester United score? How many conceded?